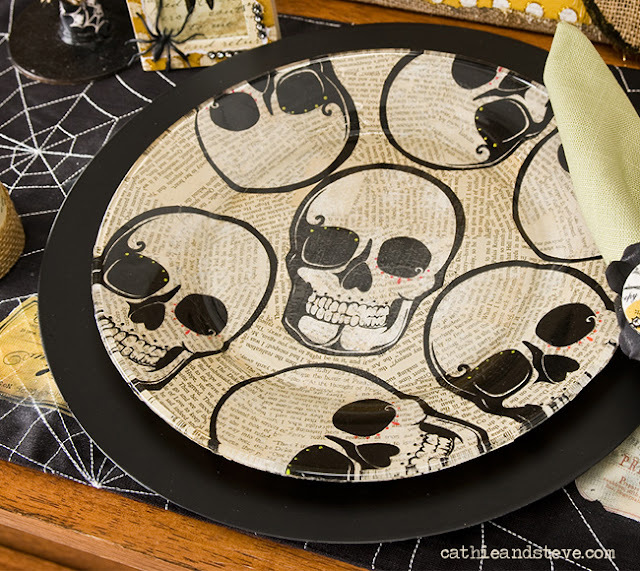 Cathie Filian: DIY Halloween Plate with Skull Napkins and Mod Podge...So Easy! DIY Halloween Plate with Skull Napkins and Mod Podge...So Easy! Halloween and Dollar Stores are both favorites of ours so when we spotted the skull napkins at out local dollar store I just knew that they need to be crafted into something! So here ya have it! Skull Plates. For all the Instructions visit out page at Plaid>>>> Instructions HERE! Cut a Halloween motif from a paper napkin. Position the motif right side down onto the back of the plate. Topcoat with more Mod Podge. Apply old book pages all over the back of the plate. Keep adding and allow to dry over night. Hand wipe to clean. All dry and ready for serving Halloween treats! These turned out so cool. I LOVE those clear glass plates from the dollar store - so many possibilities! Thanks Heather! Can you believe they had these cool napkins at the dollar store. LOVE the print and plates too! Another brilliant craft indeed. It is really a cool share. Thanks a lot for the share. Thanks! I love using napkins for decoupage. Really great textures!